Some club members have been good enough to document the methods used to produce their article. Click on the photograph for more detail of the projects. 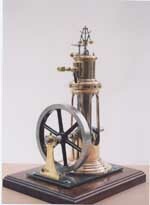 Maudslay Columnar Engine Built by Rusty Titford. Castings and Drawings supplied by Anthony Mount. Text and photos from supplied 2010 exhibition notebook.